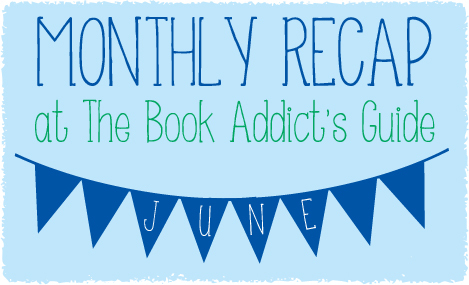 June 2015: Recap & Wrap-Up! NO REALLY where did June go!?! I was honestly on Twitter, seeing people saying things about how they loved monthly recaps and I was like, “Oh that’s nice but it’s not even time yet…” NOPE, it was July 1st. June flew by even quicker than previous months and I feel like I did a whole lot of nothing… But I guess the reading wasn’t so bad! Number of Books Read: 7 — For some reason I had a hard time reading print this month! I just got REALLY into audiobooks and naturally, those take more time! More Amusing Search Terms: “books mentioned in boy meets world” (no, but let’s hear the answer to that!) // “young adult books inspired by disney movies” (Yes!) // “blog niches for book addicts” // and something else super raunchy that I didn’t even want to list it. How did THAT lead to my blog!? Eeeeek. The most popular post this month was my reading recommendation list for those who liked Divergent! As usual, my guide to crossover books and Best-Friend-Turned-Boyfriend Romance posts are still in the tops! My most popular post actually posted this month (*wink*) was about my guesses for what the American equivalent of Hogwarts might be like! I read all of A.C. Gaughen’s books in one fell swoop and did a series review for SCARLET, LADY THIEF, AND LION HEART! I did a re-read of CINDER by Marissa Meyer and shared some feelings on it! I loved DISSONANCE and eagerly picked up the egalley of RESONANCE by Erica O’Rourke! Patrick Rothfuss is king. I LOVE the Kingkiller Chronicle and became even more obsessed with THE WISE MAN’S FEAR! MY LIFE NEXT DOOR wasn’t how I thought it would be… but that wasn’t a bad thing! I had another “bookish addition” post all about my obsession with Instagram! This month’s Pub Date was All-American in honor of the 4th of July! I got to be a part of a Huntley Fitzpatrick promo for THE BOY MOST LIKELY TO and selected a superlative for my blog! A FRIENDS book tag? Oh yes! June 30th’s Top Ten Tuesday had me sharing my favorite reads of 2015 so far! I went to the Boldly Bookish tour! Thanks to Bloomsbury for inviting me to hang out with the authors beforehand and for bringing a fantastic group of ladies to town! A bunch more authors will be featured on Book and a Beverage! The third round of On the Same Page Secret Sister is open for sign-ups on 7/12! Be sure to check out our FAQ page + all the info you could need before sign-ups open! Some… umm… reviews? I don’t really have many plans for July!!! Ernest Cline is coming to Naperville so I may go to that event! July 2015: Recap & Wrap-Up! May 2015: Recap & Wrap-Up! February 2015: Recap & Wrap-Up! March 2015: Recap & Wrap-Up! This entry was posted in Books, YA and tagged 2015, Books, May, Monthly Recap, Wrap-Up, YA, Young Adult on July 3, 2015 by Brittany. Ernest Kline in Naperville! I would love to go. We like in WI but I’ll be in FL for work that day. Bummer!